My son forwarded me this sobering cartoon that he saw on Twitter yesterday. I’m not sure who originally drew it, but it does describe the dark side of the American Dream that we all worry about, doesn’t it? Sorry to not have something more cheerful to send you off this weekend. If nothing else, here’s a link to a collection of funny Monday morning memes I posted last year. Its not so bad Eric. He actually grabs a few bucks, has a big smile and appears to enjoy the race. That’s the key, right?! He had too much money when he reached the cliff. Should have given some away when we was closing in on the last 100 yards. He would have felt so much more satisfaction….insightful cartoon, thanks for sharing. I thought that too! Maybe his kids are just out of the panel ready to inherit the $$$. Kind of depressing, though it rings true for much of the population. As Michael pointed out the only redeeming factor seems to be he has a smile on his face while persuing finances. Whether he is or not based on that last slide is debatable, but it certainly is possible to do so. I love cartoons because without any words, we all find a lot to interpret! Certainly a great reminder that you need to keep things in perspective. As you get older and further along in your career, many times the job requires a lot of time and responsibility. You are probably making decent money too but how long are you going to devote your life to Megacorp for it? More money is nice to have, but you likely wont be able to enjoy it the same if you wait till 60+. Agree – given the responsibility that people pick up during their careers, maybe the cartoon should show an uphill run to catch the money! Good point – and many people don’t get to run very far before they hit the cliff. He looks like he had a good long run! 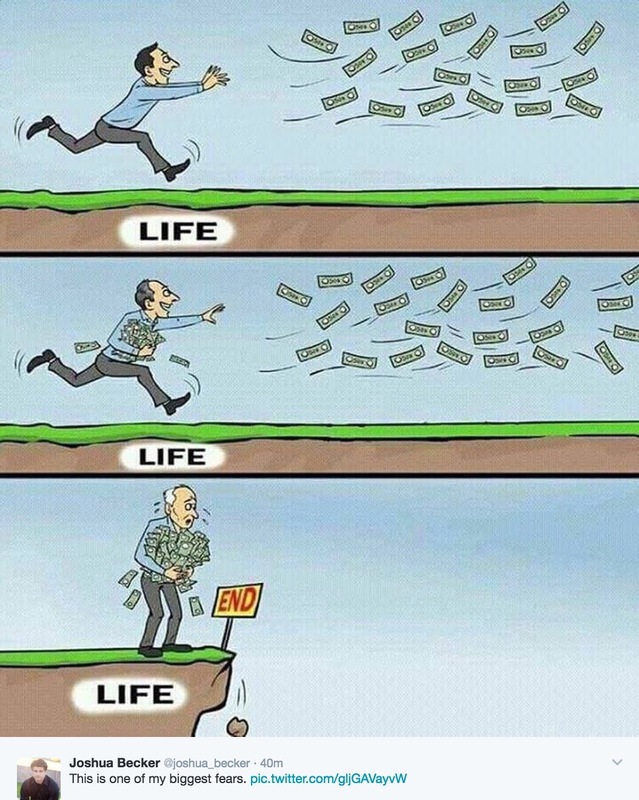 This cartoon is a sobering reminder that our life should be about more than just chasing money. I think the key is finding the right balance between living and saving. As depressing as it is to think about, no one really knows how much time we have before we get to the end.